In Glasgow's Glad Cafe recently I attended an evening of music from Mat Callahan. 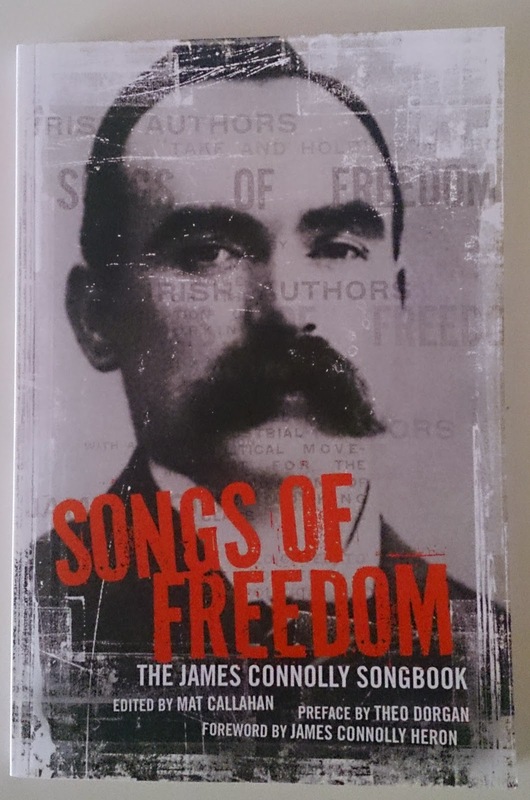 He and fellow musicians have made a recording of some songs by and about James Connolly and were reprinting his book from 1907, "Songs Of Freedom". He talked of the lengths he had to go to in order to see a copy of it (afterwards Eddi Reader offered a copy she had) and gave a rendition of one of the songs printed in the original book, by Irishman Connell, "The Red Flag" but with a "Motown feel" to change it from the traditional dirge it has become. 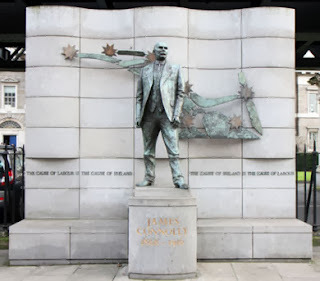 James Kelman had got involved when Mat was in Ireland and persuaded him to also visit the country of James Connolly's birth, Scotland, for two nights. It was a fantastic evening, with James Kelman in fine form, talking at length about the influence that Connolly had on Scottish socialists such as John MacLean. As we approach our Scottish independence referendum it made me want to read a bit more about Connolly and why he took up arms for Irish independence from Britain. What did he think independence would achieve for Ireland? I asked my dad if he had anything on him. He said "I've got a few of his books. I used to have his Songbook, but I think I loaned it to someone and never got it back." (Aaaargh!) I consider myself not so much as an 'undecided' on the referendum question, but as a 'yet to be persuaded'. Too much nationalist language in general is about being better than others, whether it is the rest of the world, or a close neighbour. This is something that can only be negative and parochial. Nowhere in the current debate am I hearing about the ideals that we can aspire to in an independent country. Perhaps we could aim to be greener, more peaceable, more just, fairer. Liberty, egality, fraternity - that sort of thing. Looking at the headlines on a newspaper website by searching the word 'independence' the lofty subjects include "would face greater security risk", "face tough choices on tax", "jobs fears" and "we're all doomed" (I made that last one up). It is almost as if a country of 5 million people is unheard of. People can apparently only succeed as a giant supermarket of a nation, there's no room for a worker's co-operative corner shop on these streets. Maybe one angle the 'Yes' campaign should emphasise is that becoming independent has not stopped Bosnia-Hercegovina getting to the World Cup finals in Brazil next year, and Croatia are also still in with a shout. But maybe this highlights part of the problem. Scotland has always been a wee bit of a separate country from England anyway whether in law, sport, education, history or perspective. None of these benefits other states may fight for can be so prominent in our debate as they may be in other parts of the world. So I think we need to hear about what Scots, given a blank canvas, think they could achieve. What virtues could our country aspire to? "If you remove the English army tomorrow and hoist the green flag over Dublin Castle, unless you set about the organisation of the Socialist Republic your efforts would be in vain. England would still rule you. She would rule you through her capitalists, through her landlords, through her financiers, through the whole array of commercial and individualist institutions she has planted in this country and watered with the tears of our mothers and the blood of our martyrs. England would still rule you to your ruin, even while your lips offered hypocritical homage at the shrine of that Freedom whose cause you had betrayed." "No revolutionary movement is complete without its poetical expression. If such a movement has caught hold of the imagination of the masses, they will seek a vent in song for the aspirations, the fears and hopes, the loves and hatreds engendered by the struggle. Until the movement is marked by joyous, defiant singing of revolutionary songs, it lacks one of the most distinctive marks of a popular revolutionary movement; it is a dogma of a few and not the faith of the multitude." "If these men must die, would it not be better to die in their own country fighting for freedom for their own class, and for the abolition of war, than to go forth to strange countries and die slaughtering and slaughtered by their own brothers that tyrants and profiteers might live?" "We succeeded in proving that Irishmen are ready to die endeavouring to win for Ireland those national rights which the British government has been asking them to die for in Belgium . . . I personally thank God that I have lived to see the day when thousands of Irish men and boys, and hundreds of Irish women and girls, were ready to affirm that truth and to seal it with their lives if necessary." Sentenced to death he was taken to Kilmainham Goal, still seriously ill from his wounds, on a stretcher where he had to be tied to a chair to be shot. "based upon public ownership by the Irish people of the land and instruments of production, distribution and exchange." Also, there was to be nationalisation of the railways (and canals), abolition of private banks and government financed loans at cost price, graduated income tax, universal suffrage, establishment of a minimum wage, free maintenance for all children, free education up to higher university grades and public management of schools. What was the point of self-determination if it didn't provide a programme to benefit all of the ordinary citizens? Prompted by James Kelman talking about him as though we were all familiar with his ideas, I recently sought out a book on an early Scottish Marxist called Willie Nairn. He was born in 1856 in Brechin, and aged 18 he gravitated to Glasgow where he worked as a labourer and stonebreaker. He lived in exciting times. Agitated by questions of land ownership in a country still reeling from the Highland clearances and by the ideas of the Paris Commune of 1871 he studied the writings of Marx and Engels in his evenings. The Communist Manifesto (first translated into English by Barrhead's Helen MacFarlane) and Das Kapital were hot off the presses when he first read them. As John MacLean later would, he spoke at meetings and in Cathedral Square and Glasgow Green trying to spread the ideas he found there. He was a founder member of one of Glasgow's first Socialist organisations, the Social Democratic Federation and active in the infant Cooperative movement. He was president of the St George Cooperative Society which stood at St George's Cross. Nothing is left of this building except for the statue of George and the dragon which once stood atop it, but now marks the junction beneath the Great Western Road flyover. Like Keir Hardie and James Connolly he spoke out against the Boer War and criticised the socialist leaders who could "out-jingo the jingoists" as they fell in behind the war bandwagon. In 1902 he died, aged 46. Despite his origins, the poverty and hardships he endured, he looked for a better way and tried to put it into effect. Early Scottish socialists often had a desire for Scottish independence. 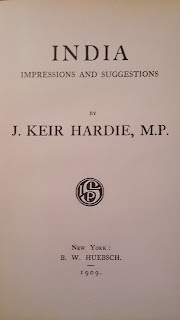 Keir Hardie is often quoted as an advocate of home rule for Scotland. He first stood for election, in 1888, as the "Labour and Home Rule" candidate but as Bob Holman points out in his biography of Hardie "this was to let the sizeable number of Irish residents in the constituency know where he stood on the question of home rule for Ireland". 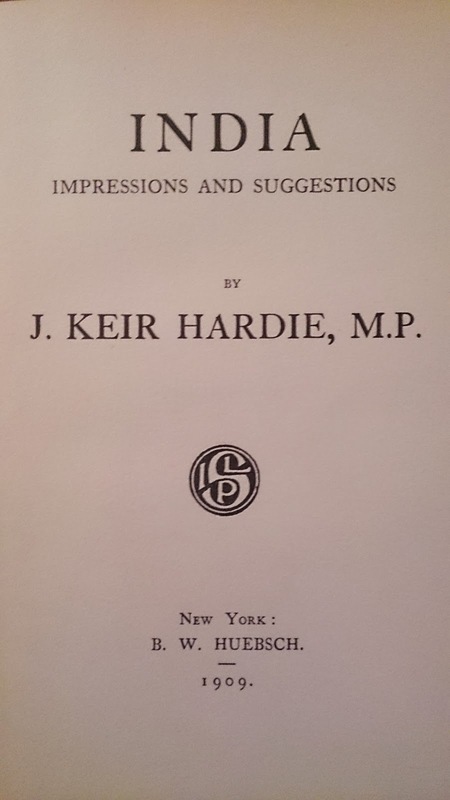 I have struggled to find any statements or writings by him on the issue of Scottish Home Rule. 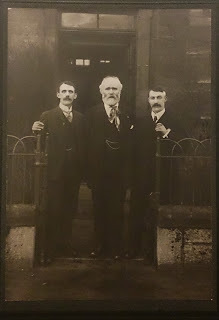 Later in 1888 Keir Hardie founded the Scottish Labour Party (not to be confused in ANY way with a party currently using that name), soon to merge with the Independent Labour Party he was to lead into parliament. In 1908 Hardie travelled to South Africa and was unusual in his day in condemning the treatment of blacks there. He also visited New Zealand, Australia and India on his tour. Writing in his book on India he writes about the Indians' desire for self government. He felt that the Indians had a right to self-determination, for their benefit and the benefit of future relations between Britain and India. "Concerning political reforms, I am certain that no matter what is done for India there can be no real pacification, no allaying of discontent, no breaking down of the barrier rising between European and Asiatic, until the people of India have some effective form of self-government." His book, which he wrote of his two months in India, is a fascinating read. The effort he goes to in order to meet people, to research facts and figures to support his arguments is just not something that you see in political analysis now. The fact that in the USA of the 1960s it was thought acceptable to segregate public transport on racial grounds seems even more bizarre than it was, when a Victorian mine worker from Holyton found it so obviously odd in the India of 1908. "When I entered the train at Madras there were two Indian gentlemen in the compartment. One of them rose as I entered and said: "Shall we move to another compartment, sir?" I stared at the gentleman and asked whether he had paid his fare.....Now I knew that in parts of America the colour line was strictly drawn, but I was not prepared for this kind of thing in India. Here, be it remembered, is a people who have inherited a civilisation which was old ere the West had begun to emerge from savagery." 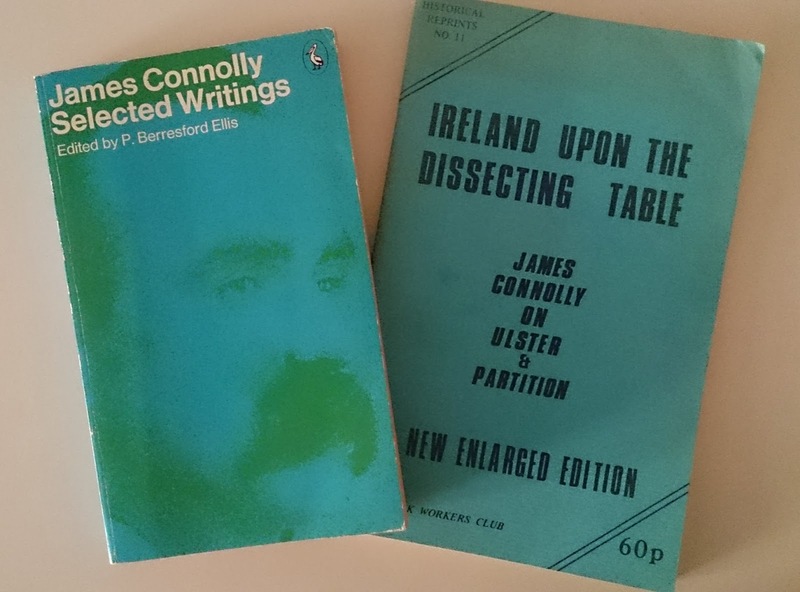 Again, like Connolly, Hardie was a man from a previous age who shaped his opinions through no narrow, parochial viewpoint. Hardie's colleague in The Scottish Labour Party it's president, Robert Cunninghame-Graham later founded the National Party of Scotland, forerunner to the Scottish Nationalist Party so there were other socialists at that time who did feel that Scottish home rule was an important issue of the time. "a Scottish Communist Republic as a first step towards World Communism with Glasgow as its headquarters." No matter how many times I read over that statement, the only response I can think of is "Build a Scottish Communist Republic, and make Glasgow the centre of this world. Bloody brilliant. Think big - when do we begin?" He also issued a leaflet in 1920, 'All Hail! The Scottish Communist Republic' with echoes of Connolly's call for an "Irish Socialist Republic", in which he made his views clear. "Scotland must again have Independence, but not to be ruled by traitor kings and chiefs, lawyers and politicians....The control must be in the hands of the workers only, male and female alike...". "Before England is ready I am sure the next war will be on us. I therefore consider that Scotland's wisest policy is to declare for a republic in Scotland, so that the youths of Scotland will not be forced out to die for England's markets." Sitting to write this and trying to find the views of these men, I struggled with my lack of knowledge about these thinkers from Scotland's recent history, and that is from someone brought up as a child in a politically active, trade unionist household. I could lay my hands on some of their writings I've bought from obscure online bookstores over the years or borrowed from relatives. Even then, what I could access in these days of the internet being the font of all knowledge, the amount of detail I could find was very limited. This is where the gap is in the current debate. It is a knowledge gap. We don't know about these working class people with sparkling, positive, idealistic ideas. We aren't taught about these men in school history, or of the tanks in George Square in 1919 or the UCS work-in. My granny, living in the Gorbals had seen and heard John MacLean, my great uncle was involved in the UCS work-in but they are dead now. The link to these words and ideas dies with that generation unless it is documented and today's children are shown what working people can and have achieved. Why fight for a new state which will keep people as enslaved as the old state? That is a question that is not being heard in the current referendum. What sort of Scotland do you envisage in the future and how can we get there? 'That's no fair' is something we see as an unbeatable argument when we are schoolchildren. We should start with this fine axiom as adults too. Surely it is clear that the historical, socialist beliefs and feelings of our country should still be our guiding principles. Take Connolly's programme and start from there. Add in the maintenance of a free NHS, the scrapping of Trident and highlight the benefits of creating a country welcoming immigrants and I'd vote for that country. Free education and childcare, minimum wage and a graduated income tax (not tax breaks for the wealthy), nationalisation of essential services. Why not add democratic control of our rich energy resources too? Yes, hoist the Scottish flag over Edinburgh Castle, but not if we end up being run by the same capitalists, financiers, commercial institutions and individuals as before. The politicians debating the referendum all look and sound like middle management people discussing how they'll run the office stationary fund better than the other mob. Come on, people. Raise the level of the debate, as so far the politicians are grinding it down to their mundane level. Think a bit bigger. Okay, you could regard a lot of what I've written above as complete pie in the sky. But if we aim for the pie, we might miss and land in the beans. There are people trying to look forwards and see what benefits we could all gain with a vote for independence, such as the Radical Independence Campaign. The Jimmy Reid Foundation, named in honour of the union leader at the heart of the UCS work-in, launched their "Common Weal Project" with the aim of starting a debate about how Scotland could develop socially and economically with "mutuality and equity" as guiding principles. I agree that we should take advantage of this juncture to start from scratch. The question shouldn't be whether we want independence or not, but what type of society we want. If independence will be used to make a better society then I'd vote for it. If not, I really don't see the point. Lenin famously said that for a revolution to occur required "mass action strong enough to break (or dislocate) the old government, which never, not even in a period of crisis, 'falls', if it is not toppled over”. I quite like the idea of jolting our political situation enough to dislocate our current politics. Start with this as a simple aspiration for a new nation and I think it would be off to a good start. Pioneer working class education and forge Scotland as a Socialist link in a worldwide chain. Scotland is a small country. However people should try to think a bit bigger. This post has solidified my nebulous thoughts on the referendum debate. I'm observing todays twitter storm over last nights bedroom tax vote and can see only entrenched ideology, little reason and no open minds. What is the point unless we "think bigger"? I want the best of socialism with the government class replaced by a cooperative model. "Mutuality and equity". I don't know how to achieve it. I'm hoping the Radical Independence Campaign conference helps. After all the sacrifice of blood, the Irish people changed masters, and a new Irish bourgeoisie developed and grew. The Scottish worker is now counselled to repeat the mistake of Connolly and subordinate socialism to nationalism. Our place of birth was accidental, but our duty to our class is worldwide. There cannot be any national unity in a real sense as long as 1% of the population lives off the fat of the land because they OWN the machines, while 99% do all the useful WORK of society. And you certainly don’t have national unity when the government speaks and acts as the protector of the 1%. The bosses consider “national, unity” to be achieved when labour quits striking against pay cuts and co-operates with speed-ups. Shame that Hardie expressed xenophobic anti-immigration sentiments about Eastern Europeans that could well be aired today by many Scottish racists. He also demonstrated his British nationalism. "I am a pro-Briton, loving my country and caring for her people. Any war of aggression against the rights and liberties of my country I would resist to the last drop of blood in my veins." I wasn't holding Hardie up as any sort of idol, just trying to look for his thoughts on independence (which are pretty thin on the ground). 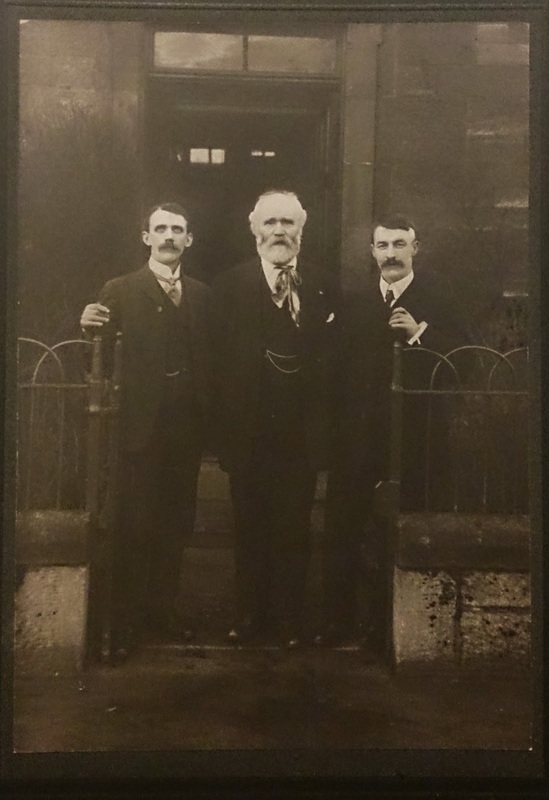 My great great-uncle standing alongside him in the photo above, like many in the ILP, maintained a stance against the First World War and his son was put in Wakefield jail as a conscientious objector. In the patriot outpourings of the coming new year to commemorate the slaughter of the WW1, Hardie and the ILP will no doubt be wheeled out but the fact was they were not unified with McDonald supporting the war. Again will it be ignored that.Keir Hardie boasted of his success as a recruiting agent in Merthyr Tydfil, and wa it a "mistake" that not one of the I.L.P. Members of Parliament voted against war credits during the war? Was it a " mistake " that I.L.P. Members were in the War Government? The I.L.P. cannot escape the full responsibility for the actions of the Labour Party, since it has been content to remain inside that body. The British Socialist Party which McLean was a member was likewise divided, he honourably was on the anti-war side. Even the SLP entered the war without a clear anti war position. Only the SPGB had a distinction of being united in its opposition to the war. I guarantee these issues will be forgotten by the Left as it pays homage to its icons. Sparks. Two Hands, One Mouth Tour. Glasgow.